Students can register for the off-campus courses once they have received a permission number from Dr. Schweizer. This is done after determining the applicant’s eligibility for the program. With minor exceptions, registration is done online. If the system indicates registration is not available, contact Dr. Schweizer at haralds@csufresno.edu. Applicants to the program must qualify for transfer admission to Fresno State. This requires the prior completion of at least 60 units, and all lower division GE requirements. Applicants who have not yet completed but are close to completing their lower division G.E. courses, can still enroll in our courses on a case by case basis as long as they make progress in completing their G.E. requirements. Applicants should email copies of their college transcripts to Dr. Schweizer who will review them, determine if the applicants can enroll in classes, and provide assistance with the formal transfer admissions process. Students enrolling in courses prior to transfer admission are not eligible for financial aid until they are formally admitted. Payment for courses can be made via credit card or online electronic bank transfer at the time of course registration. It is also possible to pay by check, money order or credit card at the cashier's window in the Joyal Administration, in which case the payment must be designated to DCGE (Continuing Ed) and made into the student's account. Credit card payments made at the cashier's window will not incur an extra fee. Credit card payments made online are processed through a third party and will incur a 2.9% processing fee. Payment has to be made in some form either at the time of course registration or within 24 hours of registering, or the course registration is voided. Contact Dr. Schweizer for course registration and payment AFTER the starting date of classes. Contact Dr. Schweizer if you do not have a student account or you cannot access it. It is important for new students to establish an account and obtain a university email address and student ID#. This information is needed to access the online course information on the Blackboard learning portal. Extension program students MUST be employed by a governmental agency at any level (federal/state/local, etc.) or employed full time in a significant security related function such as with a major bank, manufacturer of surveillance or other high tech equipment used by government. Former government employees recently laid off from area government agencies due to budget cutbacks, are eligible for the program on a "space available" basis. Documents must be reviewed by all students enrolled in CSU Fresno courses. Classes in person or orientations are held at the Fresno State campus. Read the information posted for each course. Multimode and on-line extension program course schedule, with minor exceptions, all classes will be offered online. However, students are required to attend one in person meeting with faculty at the beginning of each semester. 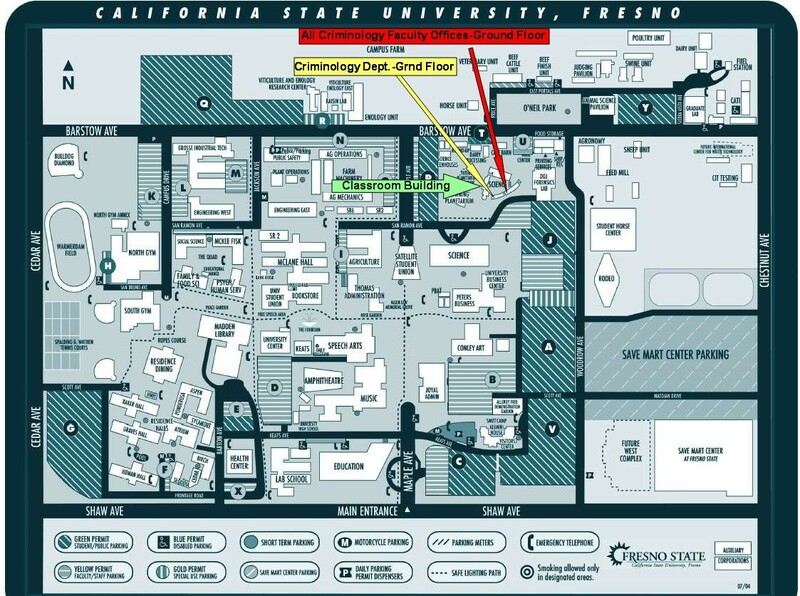 Meetings are held from 9 a.m. to 5 p.m. in the Criminology office conference room located in the Science II building. All students must have a functional computer and internet access. Students may register for any of these courses online through Continuing and Global education by visiting this website. After contacting and receiving a permission number from Dr. Schweizer, students experiencing diffficulty with the process should contact Dr. Schweizer via email. Students receiving financial aid must register for all courses offered during a particular semester at one time, but must first notify Dr. Schweizer of their financial aid status to avoid the system dropping the course registration because of non payment. Meeting of faculty and all students taking any fall 2018 courses at 9 a.m. on Saturday, August 25thin the Criminology Department Conference Room in the Science II building. Crim 113 Forensics in C.J. ; taught by Deliah Heredia (dheredia@csufresno.edu). This course will consist of several in-person Saturday meetings and visits to the California DOJ Crime Lab (optional for those unable to attend due to work related responsibilities). Class meets in-person beginning Saturday August 25thfrom 9 a.m. to 4 p.m. in the Criminology Department conference room. Additional Saturday meeting dates and crime lab visits as arranged or practical. Computer literacy and ability to use Internet based instructional services (Blackboard) is required. There will be a meeting in the conference room of the criminology department from 9 a.m. to 12 p.m. on the first Saturday of the semester for students taking any of the spring courses. Additional "optional" class meetings will be scheduled during the course of each semester. Such meetings will be held on Saturdays in Room 117 of the Science II Building. CRIM 160T Wrongful Convictions This course can be substituted for CRIM127 or counted as a criminology elective. Both of these courses are used to meet the CRIM elective course requirement. This course is primarily focused on students working in government and requires at least two Saturday meetings with submission of a 30 page paper and presentations of power points by students about their government experience, how it relates to their college coursework, and a critical look at their career. ANTH105W Upper division GE multicultural/international. Taught by Dr. Lisa Anderson (lianderson@csufresno.edu) *Also satisfies the university's upper division writing requirement. One meeting in person with instructors the last Saturday in August in the conference room of the criminology department in the Science II building from 9 a.m. to 12 p.m. The meeting is recommended but not required. The classroom is located in the building next to/behind the entrance to the criminology office. There is additional instruction for students enrolled in CRIM 01 until about 3 p.m. to satisfy the in-person requirement for the one unit course. Additional "optional" class meetings will be scheduled during the course of each semester to allow students to confer with faculty face to face and to interact with other students. Such meetings will be announced and held on Saturdays in Room 117 of the Science II Building from 9 a.m. to 12 p.m.
August-October classes require online readings and activities before the meeting. class instruction on first meeting date in September in Science II Room 110, and the remainder on line. One meeting in person with instructors on October, 14 in the Science II Building, Room 117. The meeting is recommended but not required. CRIM 109 Comparative Systems of CJ taught by Dr. H.O. Schweizer. One meeting in person with instructor in the criminology conference room in Science II. None required. All material will be posted on Blackboard or be otherwise accessible online. There will be a Saturday meeting on the first Saturday of the semester from 9 a.m. to 12 p.m. in the Conference Room in the Criminology Office, for students taking any of the Spring 2020 courses. NOTICE: The cost per unit of instruction is $290 with a three unit course costing $870. There are no other fees, except for any textbooks that may be required by the instructor. Students are encouraged to attend optional in-person class meeting from 9 a.m. to 12 p.m. on some Saturdays each semester in the conference room of the Criminology Office. These meetings will allow students to have additional interaction with faculty and other students in the program.